An incredibly powerful water filter. New to the market. Suitable for normal size family homes, up to 4 bedrooms, one main bathroom. Fantastic value: You only pay 50p a day - over 2 years - to get high quality water to every tap in your home. Never buy another bottle of mineral water again. Bathing and showering will feel so much better. Sent by next day courier from our UK Warehouse. Fully insured. When immersed in water these Active Ceramics display physical properties of semiconductivity, magnetic properties and light emission (in the far infrared spectrum). The effect is similar to a miniature electric cell. 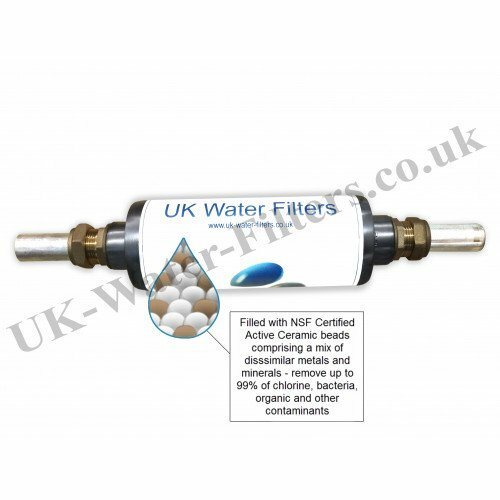 As water passes through the filter the action on the beads creates an electrolytic effect which removes up to 99% of chlorine, organic contaminants,VOCs (potentially toxic "volatile organic compounds") and other harmful impurities. Please note that as with any water treatment product results will vary, depending on the water system, water flow and water type in each household. However please rest assured that our Money Back Guarantee applies to any property. The active ceramics "Biocera (TM) " filtration media inside the whole house filter is NSF certified. This is the internationally recognised American standard for drinking water media and products. 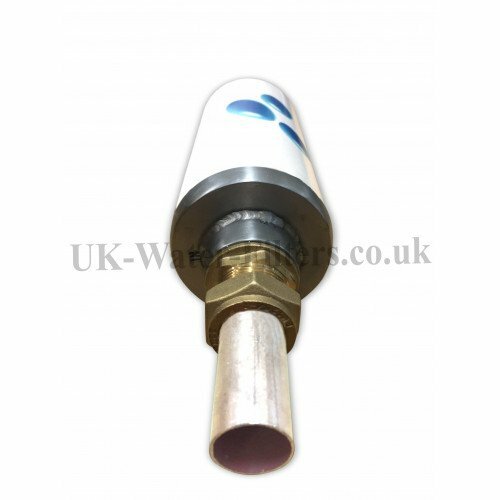 The active ceramic beads have also been classified as an approved product under the Water Byelaws Scheme - since replaced by the "Water Regulations Advisory Scheme" (WRAS) as ‘suitable for use in contact with potable water’. Special Offer Online Price £365 all incl. Average flow rate of 20 Litres per minute. Hardly any pressure loss. Max 4%. Max water pressure 8 BAR. 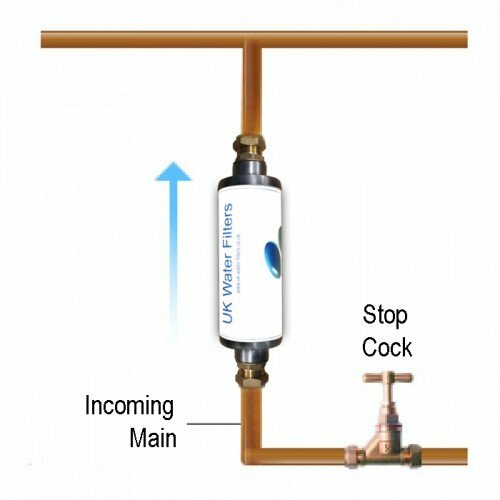 Requires no electrical or other power or salt and can be left to produce super quality water throughout the home and garden. No maintenance is required during this time. Basically your old filter is exchanged for a new one. Price for renewing the unit is £315 - assuming you send us back the original for recycling - for which we give you a £50 refund. (Just to be clear you pay £365 for the new unit and get refunded £50 after you send the old unit back to us for recycling). It fits easily into a narrow kitchen base unit or small cupboard or toilet. We've sold a lot of these units and have a list of recommended plumbers in each area who've already fitted one. Simply let us know your postcode and we'll connect you with your nearest one. Call us on Freephone 0800 009 6611 or email us for further details. I ordered the filter about 3pm on Thursday. We received it on Friday morning and I fitted it the same day. Already we have improvements. Shower glass cleaner, not having to use hair conditioner, itching irritation improving. 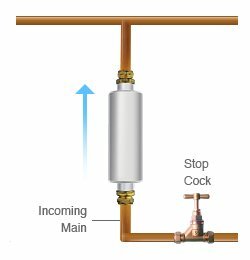 No drop in water pressure on the shower. I started using this product after a contact dermatitis and allergy diagnosis. The difference/improvement is indescribable. The water not only tastes amazing, it also has a perceptible change in texture and every one loves it at our house. It also seems to be protecting the appliances too - the kettle doesn’t get gunked up anymore and neither do the taps. When showering the water feels refreshing and there is no chlorine smell either. 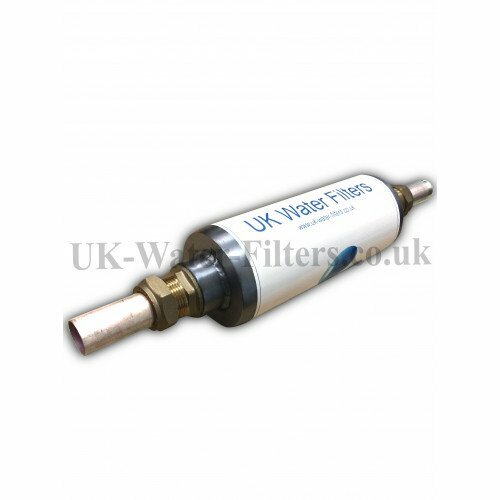 And the support from UK Water Filter’s is also faultless. Always helpful and courteous. Can’t recommend this product enough. 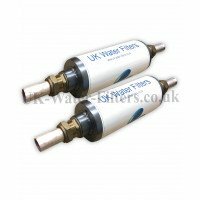 I have purchased a whole house water filter from uk water filters and I am very happy with the filter and the customer service. I’m not sure whether this counts but not only are we happy with the filter but an unexpected bonus is that it appears to make the water softer. We live in a very hard water area - close to the White Cliffs of Dover! I have noticed since the filter has been fitted neither the kettle nor the coffee machine get furred up. You don’t advertise it as a water softener but it does appear to have a softening effect. I'm really pleased the filter, it does what it says on the tin! It keeps the water clear and reduces hard water and build up on shower and does make it feel softer. Has made a difference and feels a lot better showering with the filter than it does without. The water filer is doing its job so far. We are in a horrible water area and it has kept the washing machine clear and less fur on the kettle. There has been no issues and this is our second filter. The filter doesn't clog up at all so it is great. We are in a high chlorine area and the water has really improved with the filter. I'm really pleased with it, it does what it says on the tin! It keeps the water clear and reduces hard water and build up on shower and does make it feel softer. Filter is absolutely fine. Originally bought the larger unit but we didn't need it anymore so we got this smaller unit which works just as well. We did have a bit of an issue with particles coming through at first but that has stopped now. Its working fine, the water quality is very good. I been using these filters for the past few years. Can't smell any chlorine at all. The water tastes so much better. very pleased with it, water tastes really nice, my kids notice it and can tell difference when they have it at school. we fill the kids water bottles up with the tap water so it saves a tonne on bottled water. I have also noticed the water has less of a smell now with the filter when showering. I find it good. No complaints at all. Where I am the chlorine content seems to vary a lot even throughout the night, but if you run the water for a bit it disappears so it must just be a buildup in the pipe. Other than that no problems at all. In terms of the quality of water its very good. 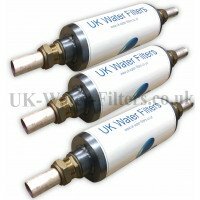 I have been very happy with it, it's our 3rd replacement filter now and always gives very good results. We will definitely come back to you for the next replacement. Have had about 4 or 5 of these filters from you now and they have all been fine. We have a plumber to fit it and had no problems with it. It has worked for removing chlorine which has been good and it is just about knowing the water if filtered and it it is consistent. 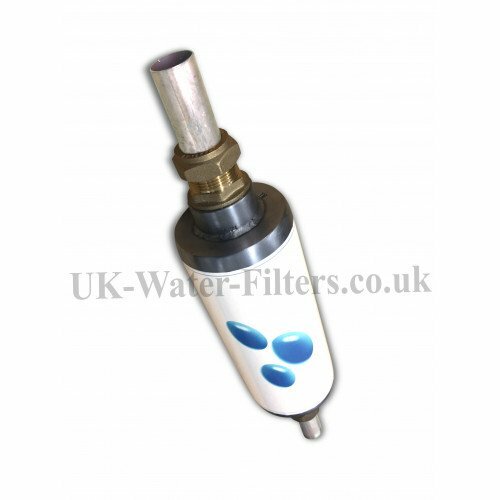 Yes I received the filter and fitted it myself, a really easy job! 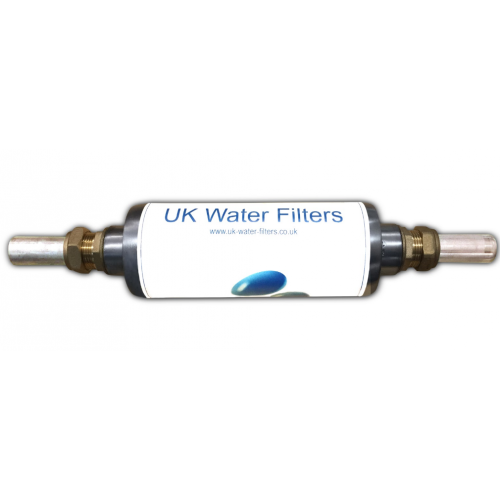 A noticeable improvement in the water quality and so much easier than using filter jugs! Only recently been installed and so far seems to be working well. The taste has improved already and decent value for money over the 2 years. Would highly recommend this product. Its small but very effective an i can certainly notice the difference in the quality of the water already. The filter has been fitted and is working really well. Thanks again for your excellent service. We'll be coming back to you in 2 years time for the next filter. I have replaced mine 3 times already. Water quality is significantly better. I actually prefer our filtered tap water to any bottled one (I don't like unfiltered tap water as it has 'chemical' taste). The filter has to be replaced every 2 years which is fair. One piece of advice, when installing the first filter make sure it's done properly (either by a plumber or you): have a bypass and use Speedfit fittings for the filter itself. It will make replacement of the filter a piece of cake (just redirect water flow to the bypass, pull out the old filter, refit the Speedfit fittings onto the new one and push it back in place). The water filter is neat and incredibly small for the job it will be doing for the next two years. The difference in the taste of our water is really noticeable AND no more chlorine whiff! The water feels different on the skin it has a ‘thicker’ almost soapy feel to it. It reminds me of when we had a water softener when we lived in Bournemouth. Although we are supposed to have soft water now we are back ‘up North’ it has never been as good as the lovely ‘polished’ water we used to get from the softener. The filter seems to do the same sort of ‘polishing’ even though it’s not a water softener! All the family are trying to get used to not having to use filter jugs, - I do not miss cleaning them out and changing the filters every month. Nor do I miss having to wait for the water to trickle into the jug before I can drink it or fill the kettle. It has been a long time since we enjoyed drinking water straight from the tap. The dogs seem to like it too… though I am not sure they are reliable enough to give any feedback as they also like drinking from muddy puddles! The filter was installed the day it arrived. These things are fantastic! If it keeps performing at this level for the next two years I will be one very happy man! Your customer service is really commendable. The whole process has been flawless. I take care of a few other properties and I am recommending this filter to them. I have only had my filter in for a few days now, but I can say it is worth every penny. I don't have itchy skin after my shower, laundry is cleaner, soap scum and scale are greatly reduced. The filter is 5 star and the customer service is 10 star. If you are thinking of water filters or water softeners, give this one a go. Huge thanks for a quality product and quality customer service. Have just renewed our water filter again for the second time. Thanks for the reminder and thanks for the great service. Specially like being able to recycle the old filter.